After two years of saying we should take a big ride out West, we decided to do it. I am Jeff, and my wife Joyce (picture on the left) along with our friends Brad and Maryjane (picture on the right) scheduled our vacations and made definite plans to go. We both ended up getting bigger road bikes prior to the trip. Brad got a Gold Wing, complete with trailer. I got a BMW R1150RT with large sidecase lids. Here are the day by day adventures of our trip along with a few of the hundreds of pictures we took along the way. Left Berwyn, Illinois for Champaign about 4:00 pm. A few sprinkles, but no rain really; just put the helmets on for a few minutes a couple of times. Left Champaign pretty early; around 8:00 or 8:30 am, I think. Headed West on Route 72 to Hannibal Missouri. Made good time. Weather was clear and sunny. The afternoon ride through Missouri and into Kansas was very hot; probably low to mid 100's. Rode Route 36 across Missouri and part way into Kansas. South winds got pretty strong, so we headed North to Lincoln Nebraska to spend the night. Super 8 was full, but we found a dive hotel that had signs for a restaurant and a bar. Great, we though. However, the bar and restaurant were closed. Bummer. Bought some beer at the gas station and toughed it out. Went to a Keno lounge for dinner because most everything was closed for the 4th. Learned a bit about Keno, but no one wanted to actually bet. Someone said we should get an early start the next day and someone else joked 4:30 would work. Brad knocked on our door at 4:30 am. We got up and out and rode an hour or two before the sun rose. It was a nice sunrise though. Nebraska is a long state, but the interstate helps make it a little shorter ride. 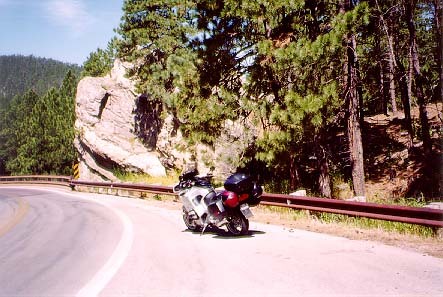 Rode the highway into Colorado and right back North into Nebraska again to head for South Dakota. 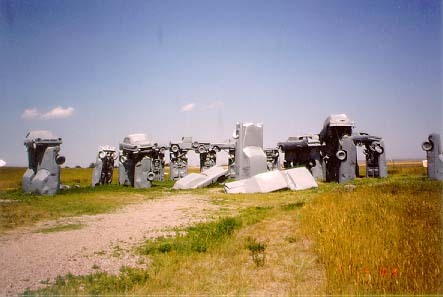 Saw Carhenge. Decided to find a campground as early as possible so we could ride the Black Hills without towing a trailer. Saw a sign about a block from the breakfast restaurant for a nearby campground and went there. A real nice place. No campfires allowed though because of some fire district rule. The owner let us leave the trailer locked up there even though we couldn't set up until later. That's OK, we want to ride the hills anyway. 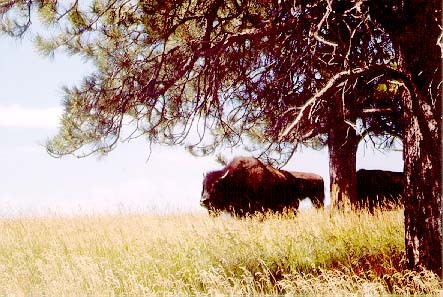 Rode up to Custer State Park and saw tons of prairie dogs and buffalo (OK, so tons of buffalo is not a whole lot; we saw about 30). Started toward the Badlands National Park , but very strong winds from the North reminded us of the Not-Fun ride yesterday. Stopped for lunch in Rapid City to bide out time and discuss a plan 'B'. 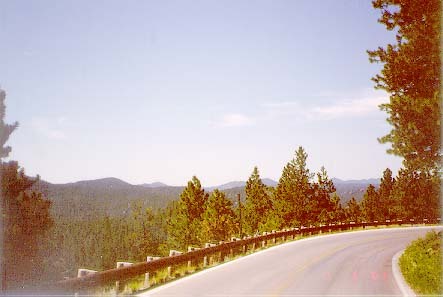 Headed back to the Black Hills and Mt. Rushmore. Actually a pretty nice monument with nice history and museum exhibits. Oh yeah, they had food and a gift shop too. 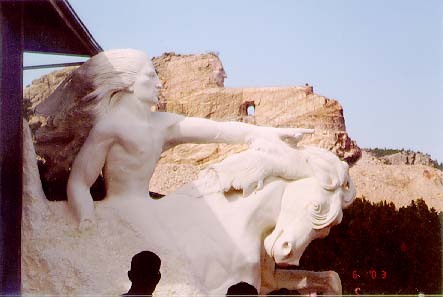 Next we rode to the Crazy Horse monument. 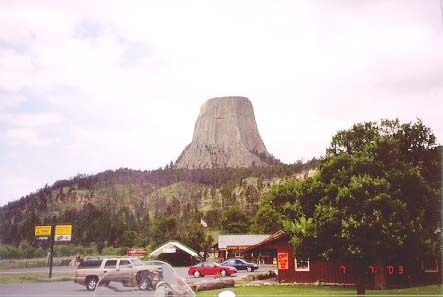 They have been trying to build it since about 1930, and still have a long way to go. 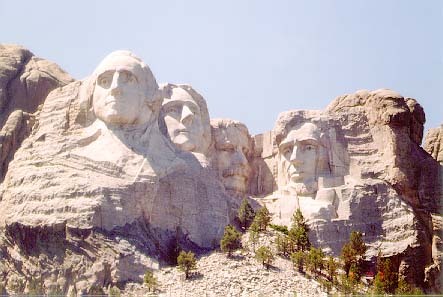 This monument was a lot less refined than Rushmore. 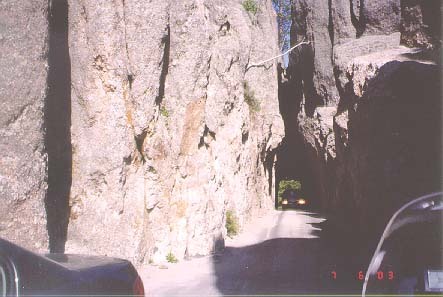 Rode Needles Highway back into Custer National Park and headed to the campground. Boy were those highways wind-ey, lots of switchbacks and turns. Lots of fun. The bike handled it all in stride. What fun. 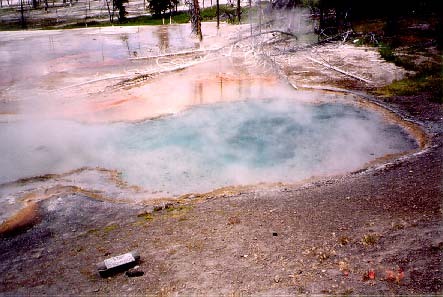 What an odd hunk of rock. Looks like it doesn't belong there. Saw several climbers at various heights. Looks too crazy to me. Headed West across Wyoming toward Cody and saw lots of different landscapes. It seemed like every hour or so we were in a different land. Saw our first peek of the Rockies finally and before too long, we were heading up the switchbacks. What views. What immensity. Totally awesome. Hit the high plateaus and had to stop to put on our coats. Started down the back of the mountain and ran into a couple of cowboys herding about 25 head of cattle right up the highway. Stopped at a waterfall to take pictures, then rode down the canyon the rest of the way out of the mountains. Canyon carving 101. What a blast. headed across the high plains. Looks like a desert and it is very hot again. Coats come off. The long straight highways beg for high speed testing of the bikes, but a crosswind helps keep us at moderate speeds (most of the time). Finally got to Cody and saw a KOA campground immediately. They had plenty of vacancies, but the site they gave us was occupied by a couple of hillbillies, so we had to get another site. Ate dinner at Irma's Steakhouse. Good food on the buffet line, good beer, poor service. Asked for two sets of silverware (only two on the table for four of us) - Never got them. Had to wander around to find them ourselves. No tip for this girl. 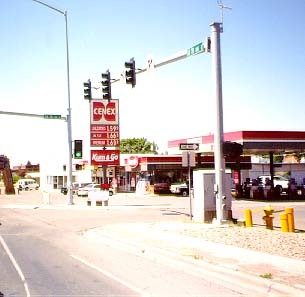 We saw several of these gas stations and just had to take a picture of the 'Kum & Go'. 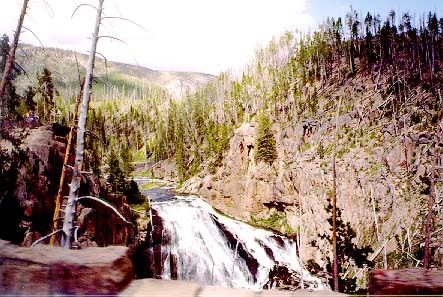 Headed into Yellowstone National Park. Another beautiful ride. Good thing we wore our coats because by the time we got to the park entrance, it was pretty nippy. The winds were strong from the SW, so another day of fighting crosswinds, but at least they weren't gale force winds like in South Dakota. The tourist traffic was pretty heavy. Lots of busses filled with foreigners. I think there were more foreigners than Americans. 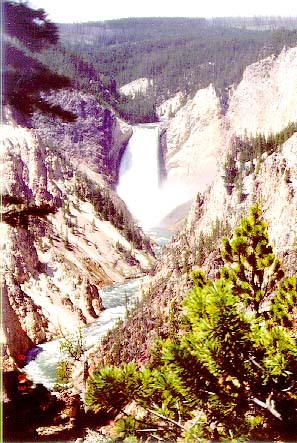 Yellowstone Falls was awesome. 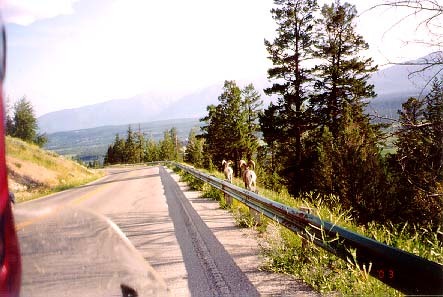 The ride was very slow and we had to stop for road work several times. 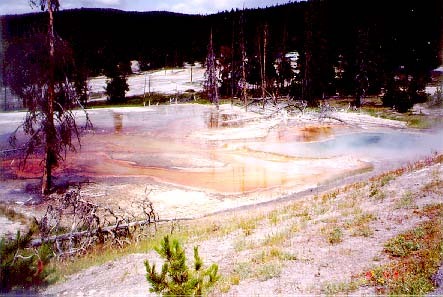 We decided not to ride the entire lower loop and headed for the hotel at Mammoth Hot Springs. What a neat old building. Had the best meal yet. Saw elk (about 8 or 9, plus a calf) walking right into the hotel area to eat the clover. One even walked right next to the building. Took pictures, of course. 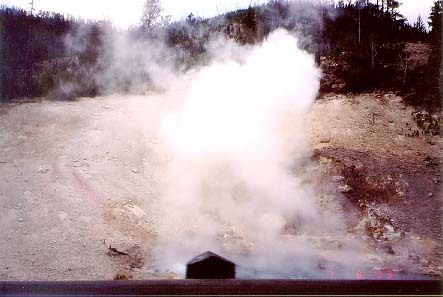 The Park's thermal features all smelled like rotten eggs and no geysers erupted, so it got monotonous after seeing about 50 steaming holes in the ground. 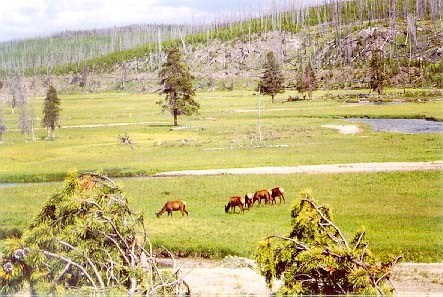 Most of the forests had been burned in the recent past (10 -20 years), so lots of dead trees. Some really poorly maintained roads, but also some really nice sections. 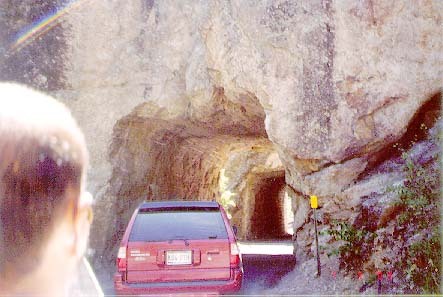 Too bad all the tourists drove so slowly. Not many places to pass either. 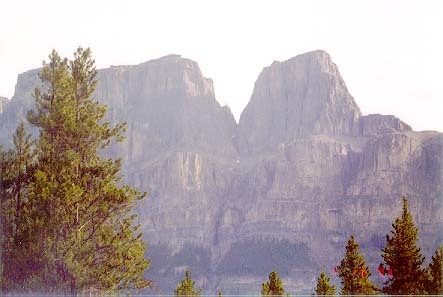 Headed for Glacier National Park. We are a couple of days ahead of schedule, so we are planning to tag Oregon before we go to Canada. 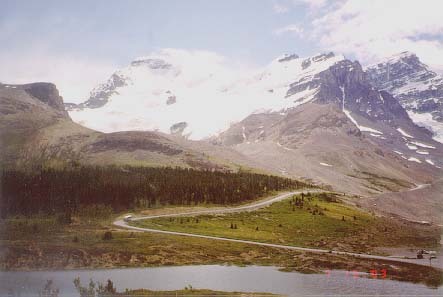 Another day of awesome vistas, beautiful clear skies, and about 75 miles before Glacier, those nasty gusty crosswinds. What a drag. A couple of spots had crosswinds that hit you hard first from the West, then just as hard from the East. Pretty difficult going. Stopped for gas in Browning and saved a woman from pouring gallons of gas on the ground. The nozzle stuck open and was overflowing her tank. Then we got hit up by Indians (drunk) begging for handouts. One had a badly smashed nose and told us how the white man stole everything from them, then proceeded to tell us which roads were best to take and could we help him buy something to eat. Yeah, right, something to eat. Wink, wink, nudge, nudge, say no more. Stopped at the KOA in St. Mary for the night. Made our first campfire. Chilly morning. We bundled up for the ride over the Continental Divide via the Sun Highway in Glacier National Park. Glaciers to the left of me..., glaciers to the right..., here I am... 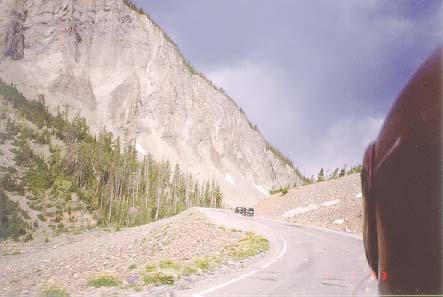 The roads look like they are barely hanging onto the mountain and might break off any day. 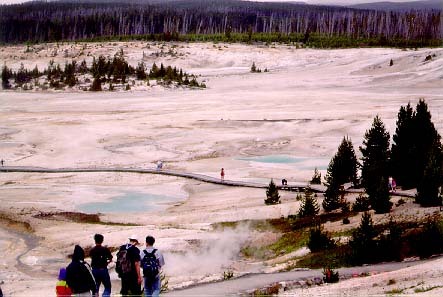 We entered the park about 1/2 hour before the gates were manned, so no entrance fee. We figured they would stop us on the way out, but no one did. Saved $8.00 per bike. 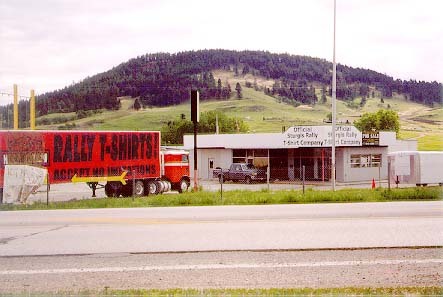 Ate at a nice little caf� in West Glacier, the rode South between two mountain ranges toward Missoula. Turned West toward Lewiston and found the Mother of that baby 'dragon tail' in the Appalations that everyone talks about. What a ride. 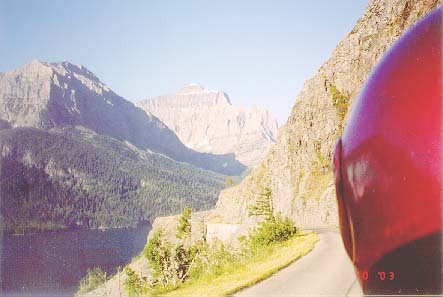 From Lolo Montana, all the way to Lewiston (about 200 miles) was constant winding as the road followed the bends of the Lochsa river as it zigzagged rapidly from the mountain pass at the Idaho border, flowed into the Clearwater river and wound its way all the way to Lewiston. Man were we beat. The temps hit the high 90's, so we were also baked. Just as we neared Lewiston, we had a brief visit from our daily gusty winds, but that only lasted a few minutes until we hit town. A hotel night was the popular vote, so we stayed at a Red Lion Inn with an attached microbrewery. 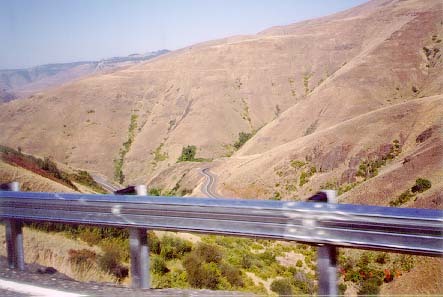 Rode into Washington and Oregon on a very curvy highway that climbed up and down very steeply several times. 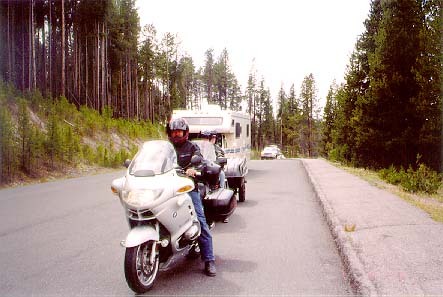 Once we hit Oregon, we turned around and headed back to Lewiston, gassed up and headed North to Couer d'Alene. Checked in at a KOA East of town and swam in the pool for a while. Bought some Margarita mix for after dinner and watched the sitcom of the woman trying to find the best campsite, then trying to put up her tent in the space next to ours. Better than television, (or was it just good Margaritas). Headed into Canada. Border guards only asked to see our Driver's License, but punched it into a computer and asked if we had any firearms. I answered 'No. ', then he asked if we usually carry firearms. Hmmmm... do we look like the type that usually carry firearms?? Of course, he had no sense of humor. He let us through anyway and we rode to the Red Streak campground to stay for the night. 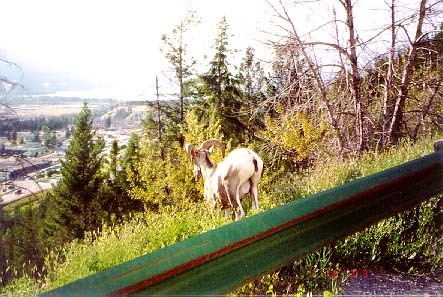 It lies on a bighorn sheep migratory path and we saw 3 or 4 on the road going into the campgrounds. Did the usual good dinner, cigars, and beer. 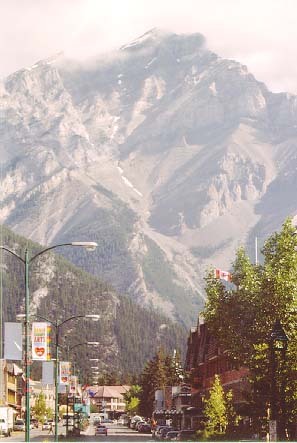 Checked the hotel availability and pricing and decided to stay at the Lake Louise Inn because the weather looked to iffy for camping. It was mostly cloudy all day, but only rained for about five minutes during our breakfast stop. The ice capped mountains caught the passing clouds and made for a very unsteady climate. 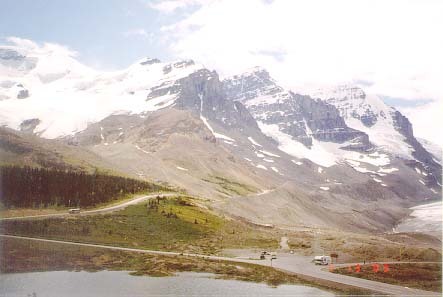 We rode the Icefields Parkway to the Columbia Icefield in Jasper Park, about 90 miles North of Lake Louise. 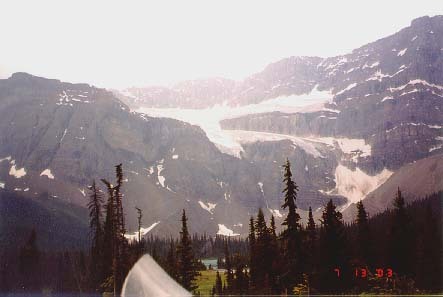 Every turn revealed another awesome mountain peak with ice, snow, and glaciers. 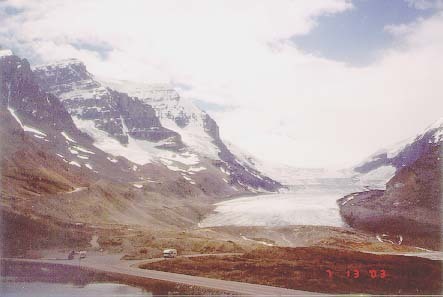 We saw dozens of glaciers. It drizzled ever so slightly a couple of times on the ride, but no rain. 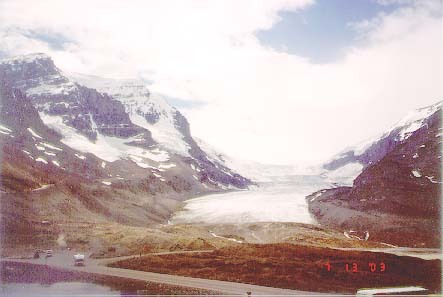 The Columbia Icefield was amazing. A couple of thousand people were there taking pictures, walking on the glacier, and buying tickets to take bus rides on the glacier. 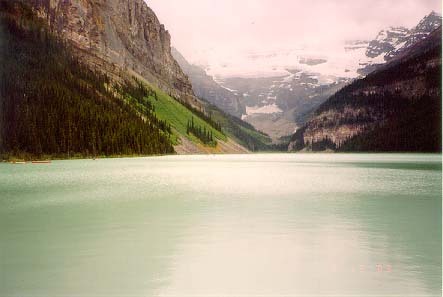 Rode back to Lake Louise and rode to Lake Louise (the actual lake). The color is hard to describe, almost luminescent turquoise. Made reservations for dinner in the main restaurant, but once we saw the extremely limited and expensive menu, we decided to eat at the hotel caf� instead. We saw only one party eating in the restaurant. The caf� was packed. You do the math. After dinner, we had a nice Cuban and a couple of beers at a great firepit gazebo, then went to one of the room's to sip scotch and watch the videos we had shot so far. After some good laughs, we retired. ate breakfast and walked around the shops for a while. What a tourist trap. Lots of shops with almost identical merchandise. It is a ski town, so that probably explains it. Headed for Calgary, accompanied by a strong crosswind. Tried to find a cigar shop in downtown Calgary, but it was out of business. Rode around the downtown area trying to get back onto the highway for a while. Finally got East of town, stopped for lunch at a pub that knows how to cook a steak, and rode on to Medicine Hat; still dogged by those strong crosswinds. Stopped to camp there. Rode across the boring straights of Saskatchewan. Stopped at Moose Mountain Provincial park, an oasis in the boring landscape. Winds were fairly strong from the West most of the day. Left Saskatchewan. Hit Manitoba. 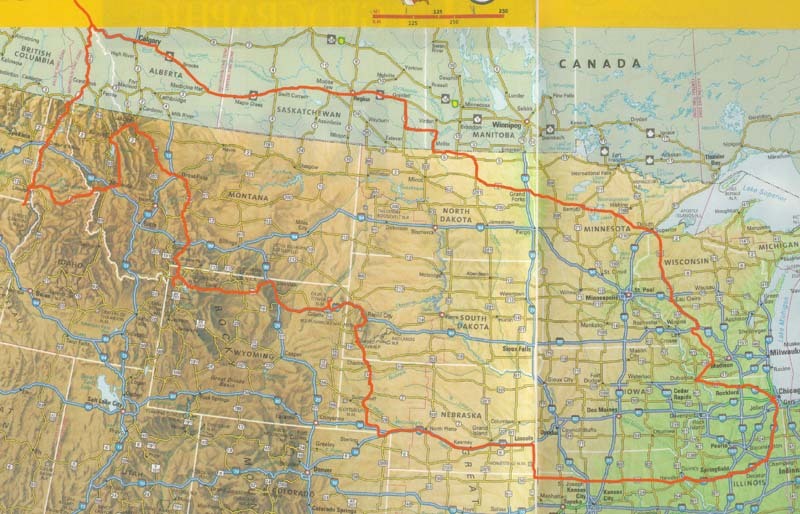 Rode down to US customs (simple crossing), then into North Dakota. More fairly strong winds all morning, but they eased by midday. Crossed North Dakota and rode into Minnesota. Stayed at the Bimidji KOA for the night. Headed for Duluth. Cold gusty winds got colder and gustier as we neared the bridge into Wisconsin. Ate at the traditional Perkins stop, then headed toward Eau Claire and stayed at a motel because a storm front was over the area. Rode the last 125 miles or so to home. The End. 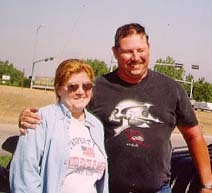 - Total length of trip was 5700 miles and included 15 States and 4 Provinces. - Canadian highways are not that great. Highway 1 needs to be repaved. Speed limits are slow. - The Tour King bike cover does not fit quite right on the BMW if you have GS mirrors installed. - Sidi Sympatex boots were great. Did not need any other footwear. - Garmin GPSIII+ was a great aid, but not perfect. - Start riding early. Winds get stronger as the day progresses. - Set up camp/hotel early. They fill up as the day gets late. - Throttlemeister was great to have. - Gerbings were definitely worth their weight. They pack pretty small too.